We stayed here for an extended weekend in April. It was excellent. The apartment is wonderful and exactly as described. Check-in and check-out went very smoothly. Nice and cozy areas to explore, eat and drink within walking distance. All in all, an excellent stay. My wife and I spent 7 nights in the apartment of 5 rue Jacquemont. What a wonderful experience! Not only was the apartment beautifully and very tastefully furnished and had all the equipment needed, but in addition, the beautiful terrace was such a treat!. Very nice contact with the owners, everything went smoothly. Definitely trying to come back next year if they have availabilities. Very nice neighbourhood, plenty of restaurants, bars and shops around. I would recommend warmly! This is a delightful, fully equipped, comfortable, well maintained and charming apartment in the 17th arrondissement. Everything is as described and I can't think of anything that was lacking. The balcony is incredible and the one evening and morning that we were able to use it we fell in love with the view and experience. We thoroughly enjoyed our week despite the fact that it rained almost every day leading to the worst flooding in many years. Being active walkers we found that we could get almost anywhere we wanted on foot - Montmartre is very close - and walked many miles on a daily basis. Metro and bus stations/stops are close by for those who want, along with anything else you might need in very close proximity. As has been mentioned speaking a bit of French is helpful and we found that an effort on our part to communicate using French was warmly received and helped immensely. Our entire experience from considering a rental to the welcome we received was excellent. You cannot go wrong by chosing this for your place to stay whilst visiting Paris! Enjoy!! 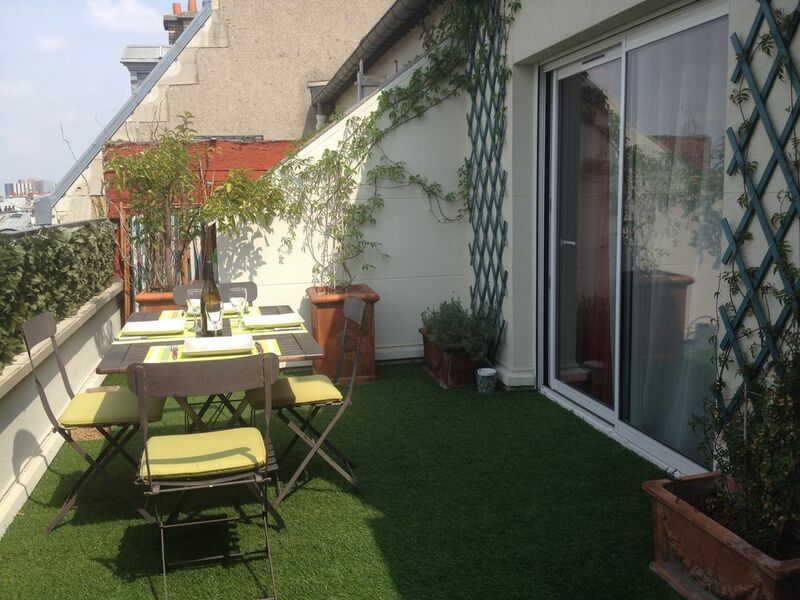 This is a wonderful small apartment with a large terrace in the Batignolles neighborhood. Close to many shops, restaurants, bakeries. We enjoyed the area quite a bit and ate in most nights because you can find good food at a reasonable price to cook at home near the apartment. The apartment has absolutely everything you will need. We did not meet Claire and Francois because our plane was delayed but Annie met us and went over everything..it does help if you speak some French in this part of Paris. The owners were very helpful and quick to respond via email or phone. Close to metro and bus stops to get you anywhere in the city easily. Definitely recommend and we would stay here again on a repeat trip. This apartment is a gem, the most perfect stay for couples while in Paris. The lovely terracce makes it difficult to get out into the city as you may enjoy the sights of the city with a glass of good red wine or champagne! The apartment does not lack anything, and it is extremely cosy and well equipped. The location is great and it is nearby metro stations or buses that will easily take you everywhere you want to go to all the interesting sites in Paris. The neighborhood has good restaurants, cafees and shops where you can buy fresh bread, wine, cheese, fresh fruit, meat, fish and whatever your heart desire. I have already spent a couple of holidays in Paris before, but this was the best stay ever. Les Batignolles is not a very well known corner of the city, but it is by far my favorite spot: so many options for great food at the doorstep, and excellent connections by metro and bus (a direct line to Paris Nord makes it very easy to reach). Great cafés and small, affordable and delicious restaurants everywhere. A very relaxed atmosphere. But the real gem is the flat itself. Its clean and light, and all you would ever need is present. The welcome by Annie, friend of the family, made us feel right at home. The outside place is great for evening apéro, the view being stunning. At the risk of it being booked permanently and me not finding a free spot again: I recommend this place as a great deal and a perfect home away from home.